JAKARTA, Indonesia — In the photo, the mother rests one hand on her youngest son's arm. Two little sisters in the front hold flowers against matching red head scarves. Dad stands in the back next to the oldest son who has already outgrown him. The six are dressed in happy prints and colors — a purple batik shirt, a pink flowered dress — and Mom's flowing headscarf is the color of sky. It appears to be a picture of a happy middle-class Indonesian family. But it has shocked the world's most populous Muslim nation this week by becoming its new face of militant violence. But on Sunday, they fanned out with suicide bombs attached to themselves and their children, attacking three churches. 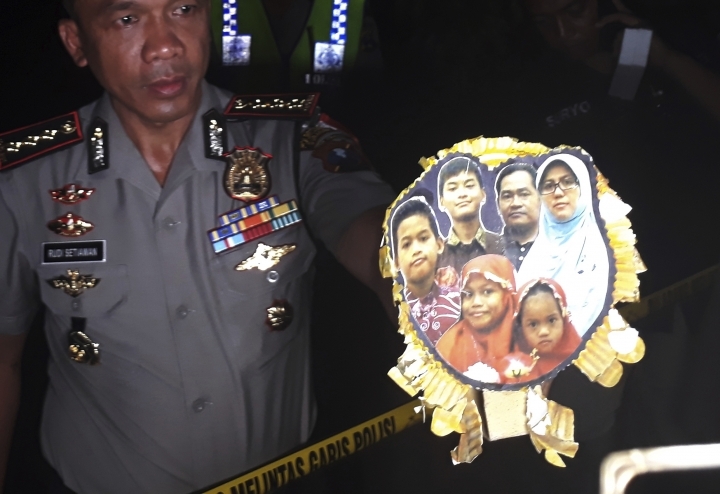 The entire family was killed in Indonesia's second-largest city of Surabaya. At least 13 people died in the churches and more than 40 others were injured. The youngest human bomb, the little girl staring directly at the camera with big brown eyes, was just 8 years old. Her big sister was 12. "For the kids, I think this is craziness," said Taufik Andrie, who runs an Indonesian institute that helps rehabilitate former militants ready to rejoin society. "It's the first time in Indonesia. I'm afraid this will be a new trend." "I think the message is simply that they can create momentum," he said. "And they don't want to lose it." "We've got hundreds of fighters coming back. Probably the Indonesians don't even know how many are coming back," said Bilveer Singh, a political science professor at the National University of Singapore. "If you don't get this thing right, then you are going to get more and more terrorist attacks in the coming months and years." He said the buildup to Indonesia's presidential election next year coupled with growing religious intolerance could spark new violence, especially if Islam is used as a politicizing weapon. President Joko "Jokowi " Widodo has struggled to push through anti-terror legislation proposed since 2016 which would make it easier for law enforcement officers to go after extremists. In condemning the recent attacks, he vowed to issue an emergency presidential decree if parliament continues to drag its feet. "I'm not afraid of the bombing. I think it's the rising radicalization and growing intolerance of Indonesia," Singh said. "It has been moving in a very dangerous way, and it has not been stopped. And I think the danger of Indonesia is not tomorrow. The danger of Indonesia is in the next five to 10 years."